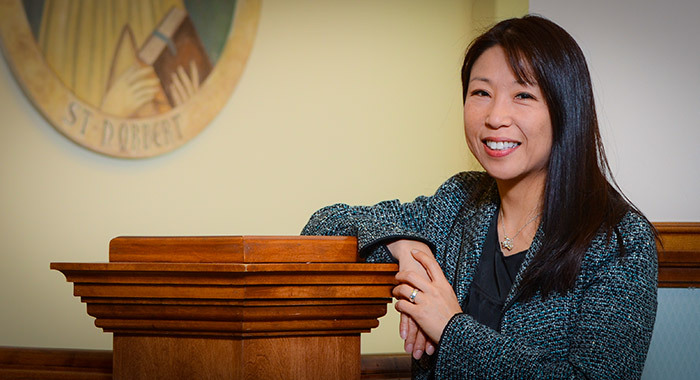 It was a sense of what’s already in place in the St. Norbert community, along with its evident eagerness to do more, that attracted Amanda Kim to her work at St. Norbert College. The Chicago native is the first incumbent of a new position in the president’s office, where she serves as senior adviser for equity, diversity and inclusion. Kim, who also has served at Michigan State University, University of Akron and the University of Michigan, contrasts larger, state- or research funded institutions with the small liberal-arts, Catholic culture of St. Norbert College. At the same time, she recognizes the importance of working with the majority (including longtime faculty and staff) as well as alumni, many of whom have experienced diversification at work. She says she’s impressed with what is already happening, citing the Sturzl Center for Community Service & Learning for its efforts to connect students, faculty and staff with the community; the Cassandra Voss Center and its work with gender and identity issues; and Multicultural Student Services. With the hiring of a more diverse faculty, and with the enrollment of students of color increasing annually and, this year, accounting for nearly 10 percent of the incoming class, Kim says the college already has experience of a changing culture and is nearing an interesting tipping point.